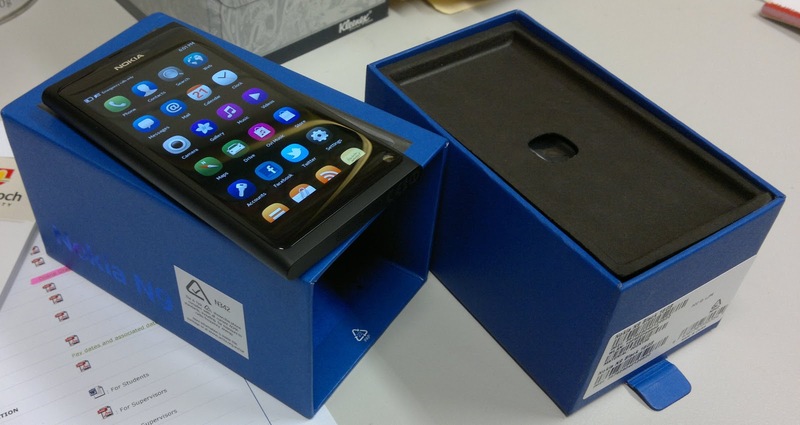 As you all know, I just received the Nokia N9 yesterday. Plenty of people do unboxing videos so we won't bore you with that. Your first impression of something is made up of the combination of first thoughts that you get when you see or experience something. Rather than just give you our first impression, let's look at the first 7 thoughts that came to mind once I got the Nokia N9. Small box as you can see from the picture, the box was quite small. How do I turn this thing on? Turns out after numerous rotations of the device and poking at a "push" sticker that had nothing to do with the power button, the button I presumed was the camera was actually the power button on the side of the phone. Light and thin the phone is amazingly sleek and we're not just saying that. We have to admit that the Nokia N8 shape was a little odd, more like a rectangular spaceship as I once heard it described. With no buttons, matte finish and a strong gorilla glass, this is more like, a businessman's iPhone? Bright and responsive Once the sleek new NOKIA welcome screen gave way to the phone's Meego user interface, the brightness of the apps was catchy, vibrant and the phone's handling of each swipe was quick and smooth. What? Micro SIM??? Here comes a problem. If you are upgrading your phone from any other Nokia, I suggest you call your phone operator whilst you await your delivery otherwise you will find yourself frustrated that Nokia has gone the way of the micro-sim. Your Nokia N8 or E72 sim card will not work on a N9. And once you switch over to the N9, there's no turning back. We'll talk more about this phone later but in the meantime, please add your name and details to the form on the right. We want to get a few N9 users together so that we can help each other out quickly when we run into problems rather than always using Google to search our way out of a hole. And if you feel the urge, leave a comment below to let us know someone is reading this!